Size: It is usually less than 160 cm long, but may reach up to 2 m.
The Blacktip Reef Shark inhabits shallow inshore waters and commonly occurs singly or in small groups near coral assemblages, but may also be found in mangrove areas. It prefers fish, but also feeds on crustaceans and cephalopods. Viviparous, females giving birth to two to four pups. While usually timid, it may become aggressive to spear fishers and has been known to bite people wading in shallow water. This species is widespread in the Indo-Pacific, ranging from the Red Sea and East Africa to the Hawaiian Islands and the Tuamoto Archipelago; north to Japan and south to Australia. According to the IUCN Red List it is Neat Threatened (NT). 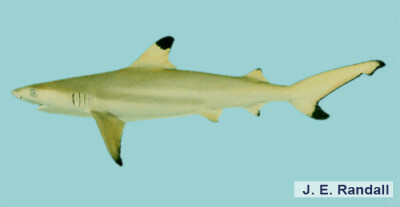 The Blacktip Reef Shark is regularly caught inshore and utilized for human consumption and fishmeal. The Blacktip Reef Shark is characterized by a short, bluntly rounded snout, oval eyes, and narrow-cusped teeth. The second dorsal fin is large and it has no interdorsal ridge. Its coloration is yellow-brown dorsally and laterally, turning white ventrally with a dark band on the flanks. All fins are conspicuous with black or dark brown tips, and the prominent black tip on the first dorsal fin is set off abruptly by a light band underneath.